Pop-up cookery workshops – give it a go in the kitchen! 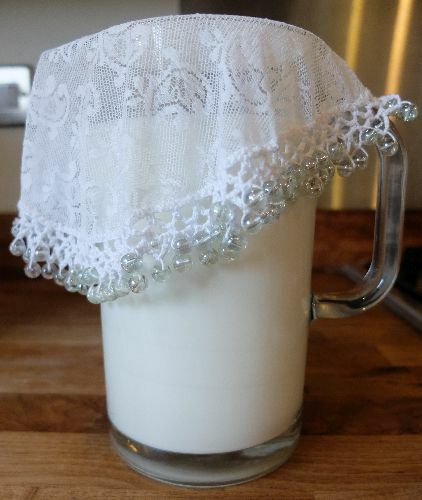 Cover the kefir to keep dust and pests out. Leave it for 2-4 days, let time do the work! Easter eggs with beautiful white duck eggs from #ParcCarreg! Last few dregs of this flour adding to the mix of today's bake. I bought it at Wells Food Fest last October, I love picking up local foods on my travels. Will enjoy these loaves even more, remembering fun times at @sauerkrautathon! A cheeky little hot toddy to blast away a chesty cough that's been simmering, *honegar's just not shifting it (*elixir of 60% raw apple cider vinegar:40% local honey). And a reminder of old friends and new - on my drive home through Wales yesterday I popped in to meet Jojo & Barrie @thehighstreetdelicatessen and was overjoyed to pick up a bottle of @thecollectorvermouth, made by my pals @theethicurean. I think they've ceased production at the mo - @jackabevan could Jojo & Barrie have some of the last stock around?! Tea & wild smoked salmon, @tanamwg and @mfh_jones collab looking and smelling amazing served with Hen Gymro soda bread - from flour milled yesterday. Pretty epic eating and eek, I'm up talking next @jwrnal_wales!